﻿ Himalayan Education And Development (HEAD Nepal), Empowering Persons with Disability! The Himalayan Education And Development (HEAD Nepal) is perpetual successor, autonomous, self-governing, organized, non-profit making, non-political, non-religious and non-governmental regional organization working for the empowerment and development of people with disabilities in the Himalayan region of Nepal. The organization was founded in 2011 by Mr. Chhitup Lama with the active participation of the local people of Humla. Today on 24th of January 2019, we have visitors: Jamuna Paudyal, Pabitra Puri and Devi Subedi from Ministry of Social Development Province No 6 and Mamata Mahat from Simkot Rm. The has visited both HEAD Vision and Enable Home and observed its provided services to the children with disabilities. At the mean time the visiting team conducted a very small meeting with HEAD Staff lead by Founder/ED Chhitup Lama about the project which HEAD Nepal is running currently and some issues and difficulties which HEAD Nepal facing after establishment with the local government. The Head Skill Development Center is a project by Head Nepal based on the idea that offering an appropriate learning environment with wide range of basic to advance trainings not only to people with disability but also to the marginalized group of society such as women, Dalit, ethnic community, single woman and conflict affected etc. to improve quality of life and promote community inclusion. The training may cover a range of capacity building, vocational and educational training, and skill/leadership development courses. The major objective of the Head Skill Development Center is to make the marginalized group of people including people with disabilities more independence and confident so that they can actively/meaningfully participate as fully as possible in family, community and society. It also organizes a series of workshops, seminar and awareness/sensatization programs throughout the year which help them for their social and economical inclusion. Humla is one of the most remote and undeveloped districts in rural Himalayas of Nepal where the situation of children with disabilities is extremely difficult. 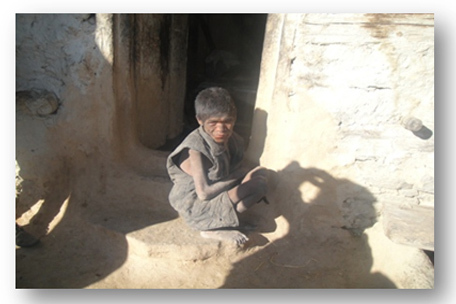 Specialized services for early detection and intervention for all disabilities are available only in distant centers offering specialist services, which are completely beyond the reach of poor families having such children from the district like Humla. Therefore, we have planned the project, the HEAD Mobile School since the establishment of the organization. The Mobile School is a first step to take literacy and education to the disabled children at their homes when they are themselves unable to come to schools and learning centers and regular schools are not able to accommodate/integrate such children in their educational process. After the successful operation of the first Mobile School in 2011 for children with visual impairment in 8 VDCs of Humla, we ran a numbers of the same school in 11 VDCs in the middle Humla for children with physical and visual impairment in 2016 and 5 VDCs of lower Humla in 2017. The major goal of the project is to promote literacy and inclusive education for the children with disabilities and their parents in the rural Nepal through operating a mobile school with literacy based educational training at their home and ultimately integrate them into mainstream education system. In this fiscal year 2016/2017(2073-2074), HEAD Nepal was successful in extending our organizational partnership with Mission East Nepal. 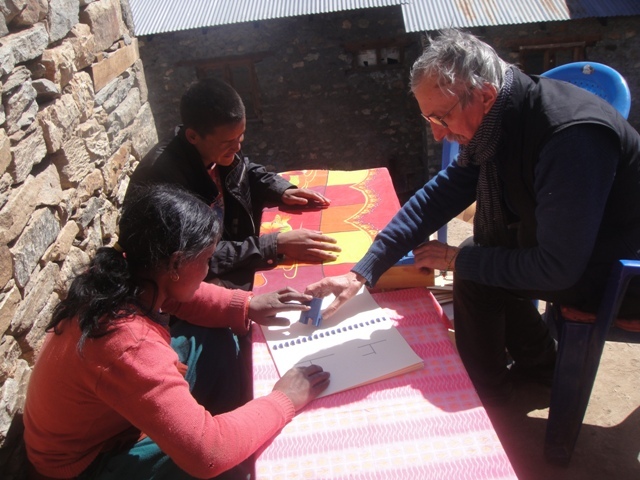 Together with mission East Nepal, we developed a new project entitled "Children and Hunger: reducing hunger and improving nutrition amongst children with disabilities and other marginalized children in remote mountain villages of Nepal" which has been financially granted from the Danish Radio and AEC Foundation for 2 years until May 2019. The project inception/induction program was conducted in August 2017 and we already started project activities then after. The overall objective of the project is to contribute toward Government of Nepal Zero Hunger Challenge Initiative (ZHC) for marginalized children in the remote mountainous districts of Nepal and the immediate Objectives is to enhance sustainable production and use of diversified crops for improved nutrition amongst children with disabilities and other marginalized children in remote mountain villages of Humla. The project also aims to improve organisational, financial and programmatic capacities of HEAD Nepal to enable sustained growth. We express our sincere gratitude to Mission East Nepal for partnering with us and Danish Radio and AEC Foundation for insuring finance for this project. »The film "The Activist Journey"
The film " The Activist Journey 2-The Hidden Light of Hope of Humla" on the Activities of Head Mobile Blind School was awarded a Bronze World Medal by New York Film Festival 2013. The film was produced by a Singaporean television Company, August Pictures Pte Ltd. in November 2011 and was on aired in 2012 in Singapore. Here is a short version of the film with the title "For the children with visual impairment of Himalayas"
On 15th of August 2014, this short film was published together by Head Nepal and Kanthari Plus. The film was produced by Tomasz from Poland representing Kanthari Plus on the educational activities and the other projects of Head Nepal. My name is Boguslaw Marek Ph.D. but all my friends call me Bob for short. I work at the John Paul II Catholic University of Lublin, Poland but I also organize programs - workshops and seminars for teachers and parents of children with a visual impairment. 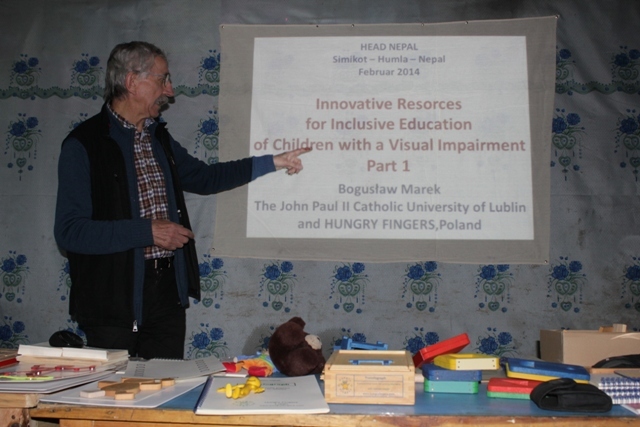 I was in Head Nepal Simikot for a week in February 2014 conducting workshops for teachers, sighted children and learners with a visual impairment. It was not easy to decide which was a bigger surprise – the beauty of the Simikot Valley, or the scope of activities and the level of support offered by HEAD Nepal to children with a visual impairment at what seemed like the end of the world in a forgotten part of the Himalayas. Web designed by Chhitup Lama, Modified by Nirmal Bista Last Updated in 11th February 2019.